Beat by the heat? Chill at these 13 cool spots this weekend. Looking for a cool spot to get a break from the summer heat? 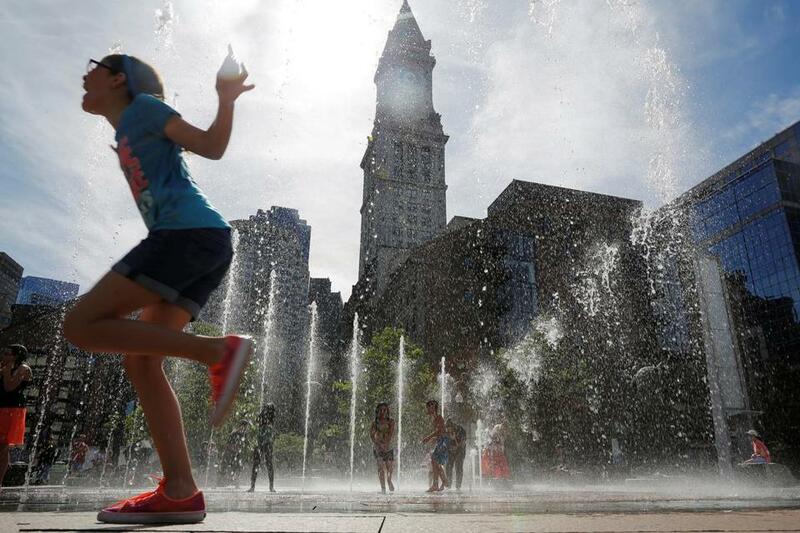 Try the fountains on the Rose Kennedy Greenway. The country is currently under an ominous-sounding “heat dome,” with temperatures in Boston soaring to the 90s and expected to stay there for some time. This may throw weekend barbecue plans for a loop, but don’t worry. There are lots of places to go to beat the sweltering heat. Legoland Discovery Center: Legos on Legos on Legos. The expansive locale will provide hours of indoor, infrastructure-related fun for your little ones. Be sure to protect sandaled feet from those little bricks, though. 9 a.m.-8 p.m., Saturday; 10 a.m.-7 p.m., Sunday. $17.50-$23. 598 Assembly Row, Somerville. North Point Park and Splash Pad: Across from the Museum of Science, this playground/spray deck has plenty of space to run, jump, and climb, and it boasts a great view of the Zakim Bridge for photographers and architecture buffs. 9:30 a.m.-7 p.m. Free. 6 Museum Way, Cambridge. Ride the ferry: Did you know the MBTA has a public transit ferry that takes you from Long Wharf to the Charlestown Navy Yard? Tap your Charlie Card and set off on a breezy, 15-minute cruise to the home 0f the USS Constitution. 10 a.m.-6 p.m. $4. Long Wharf, Boston. Taza “Chill Out Saturday Tastings”: To the pleasure of kids and grown-ups alike, Somerville’s Taza Chocolate Factory has featured free samples of frozen treats from 1 to 4 p.m. each Saturday in July. This weekend’s creation? Frozen cheesecake pops from 7ate9 Bakery. 10 a.m.-6 p.m. Free. 561 Windsor St., Somerville. Walden Pond: Part beach, part forest, iconic and historic Walden Pond has something for everyone. Picnickers and transcendentalists are always welcome and lifeguards are on duty until 6 p.m. 10 a.m.-8 p.m. $8 for parking. 915 Walden St., Concord. Sonia Rao and Carly Sitrin can be reached at sonia.rao@globe.com and carly.sitrin@globe.com, respectively.